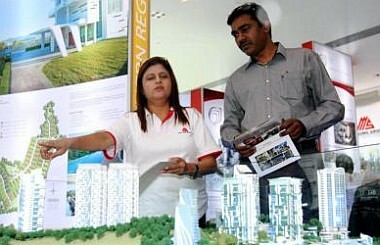 Special pointers: Mah Sing Properties Sdn Bhd representative Zaheerah Hasbolah highlighting features of one of the company’s projects to Chandrasagaren during The Star Property Fair 2012 at G Hotel. GEORGE TOWN: The Star Property Fair 2012 got off to a good start with exhibitors expressing surprise over the big turnout of visitors despite it being a weekday. Many exhibitors said they received enquiries and even closed sales within the first two hours of the fair’s opening at Gurney Plaza and G Hotel here at 10am yesterday. IJM Land senior manager (sales and marketing) Patsy Lee said she was overwhelmed by the encouraging response as they sold three condominium units shortly after the fair was opened to the public. “There were about 50 enquiries on our various projects. Based on our conversations with those who made enquiries, they were serious buyers. “It seemed they have done their homework as most of the questions they asked were pertinent to our projects,” she said. Asia Green Group director Tan Li Mei said she was thrilled over the large crowd at the company’s booths. “We normally expect people to come either at night or during weekends. But the turnout was good, considering that it is a Thursday,” Tan said. Ivory Properties Group Bhd senior marketing executive Koay Tze Chung said the response on the first day of the fair was better compared to previous years. “Many of them came well prepared by asking all the relevant details on our projects. We expect them to return during the weekend once they have finished conducting surveys at the fair today (yesterday),” he said. SP Setia Bhd sales and marketing property division (North) senior executive Agnes Chua said they received about 40 enquiries for one of their condominium projects. “It is a weekday but there is already a sizeable turnout at the fair. We expect things to get better as the fair goes on,” she said. Fifty exhibitors, including financial institutions and investment companies, are taking part in the four-day fair which is touted as Malaysia’s premier showcase for stylish living. The fair, organised by The Star for the 10th year, is open from 10am to 10pm daily until Sunday. Admission is free. PETALING JAYA: Starhill Real Estate Investment Trust (Starhil REIT) announced a final income distribution of 3.62 sen per unit for the six-month period from January 1 till June 30. The total payout amount translates to RM48mil. For the six-months ended Dec 31, Starhill REIT had paid out a 4.01 sen interim dividend. In total, its income distribution for its financial year ended June 30, 2012 stands at 7.63 sen per unit, compared to 6.49 sen per unit in the previous year. “The completion this financial year of the rebranding exercise to transform the trust into a pure-play hospitality REIT marks a turning point. Starhill REIT’s property portfolio has now been fully rationalised to focus on prime, yield-accretive hotel and hospitality-related assets. This has enabled us to achieve a 32% increase in the total income distribution from the trust to RM101.1mil, compared to RM76.5mil last year, and a 17.7% increase in the distribution per unit,” Tan Sri Francis Yeoh said in a statement yesterday. Yeoh is the chief executive officer of Pintar Projek Sdn Bhd, which is the manager of Starhill REIT. Under the rationalisation exercise, Starhill REIT acquired Pangkor Laut, Tanjong Jara and Cameron Highlands resorts, the Vistana chain of hotels, The Ritz-Carlton in Kuala Lumpur, the remainder of The Residences at The Ritz-Carlton in Kuala Lumpur not already owned by the trust, and the Hilton Niseko in Japan.